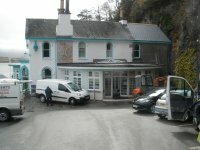 The new frontage to the main hotel building in Portmeirion, matching that of the original which was sadly destroyed in a fire in 1983, is nearing completion. With the revamped hotel interior completed in January, the new frontage and reception area is also nearly ready. More info and photos HERE. With thanks to Lee Arnall for this news item.